Fourth book in a series of four. Follows one of the characters into her new passion of rhythmic gymnastic. Aimed at 9-12 year olds – a good follow-on for older children after the Somersaults and Dreams series. 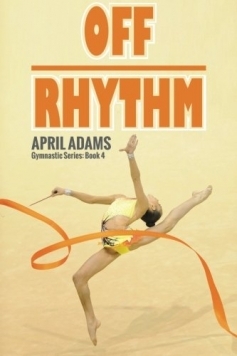 A 4-book collection, the Gymnastic Series made up of ‘Balancing Act’, ‘Tumbling Dreams’, ‘Flipping Out’ and ‘Off Rhythm’ are written by an ex-competitive gymnast. Kelley steps to the mat. Presents and poses. Inhales. Steps and extends her leg. Exhales while throwing herself into a wind-milling leg extension that positions her pointed toe exactly opposite from the tip of her head. Her pointed leg spins in opposition to her shoulders and head so that when her foot reaches straight up to the sky, her head almost touches the floor and all while spinning a hoop on her wrist. Kelley and the Kips are back, but this season Kelley is determined that not only does she need to execute skills with precision and performance, she needs to do it while throwing, catching and balancing a ball. Rhythmic gymnastics is Kelley’s new passion but can she balance old friends, new friends and her sport, or will she be thrown Off Rhythm?